St. Martin’s Lutheran Church in downtown Austin was miraculously transformed into a Russian Cathedral last weekend as Conspirare presented a concert of Russian Orthodox liturgical music. It was astonishing to hear the 41 voices of the Company of Voices singing their hearts out with total command of both the language and the style of the music. Conspirare’s artistic director and conductor, Craig Hella Johnson, (photo: right) has boundless imagination when it comes to programming; once again, he presented Austin audiences with some unusual and deeply satisfying musical nourishment. The Russian Orthodox Church dates back to the Tenth Century (988 A.D.) and has its roots in the Byzantine form of Christianity. For much of its history, the music written for the Russian Orthodox Liturgy was required to be ‘a cappella,’ or unaccompanied. The music we heard in this concert was entirely ‘a cappella,’ and while some of it made use of the ancient Znamenny chants, most of it was written within the last 125 years. Stylistically, it is conservative as one might expect from a church so steeped in tradition; nonetheless, it was surprisingly varied and totally engrossing. One of the world’s leading authorities on Russian liturgical music, Vladimir Morosan, acted as program advisor and consultant for this concert. He gave a pre-concert talk before last weekend’s concerts, and also wrote notes for the program book, which point out that over time “Russian church singing was enriched by stylistic borrowings from the Polish Baroque, the Italian stile antico, Viennese classicism, and German Romanticism,” and that women were finally allowed to sing in Russian Orthodox Cathedrals at the beginning of the 1880s. Conspirare concerts often begin with a choral processional from the back of the church to the performing space in front of the altar. This somewhat theatrical device is entirely appropriate in a church and it was used to great effect in this concert of Russian sacred music. What a way to begin a concert! It was thrilling to hear Tchaikovsky’s “Come, Let Us Worship,” surrounded by the singers. This happened again with even greater success later in the concert as the choir members sang from opposite sides of the church in an ecstatic performance of Gretchaninoff’s “The Lord’s Prayer,” and the “Sunday Communion Hymn” by Pavel Chesnokov. There was music on the program by only one living composer, Vladimir Martynov (photo: right). Martynov was born in Moscow in 1946 and has had an interesting and varied career. Early on he dabbled in serialism and later started a rock group. 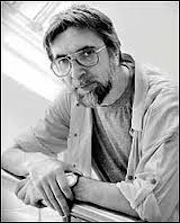 He was then attracted to minimalism and from the 1980s on, he devoted himself to writing music for the Russian Orthodox Church. His best-known work is “The Beatitudes,” a piece that exists in many versions, including one for string quartet recorded by the Kronos Quartet on Nonesuch. 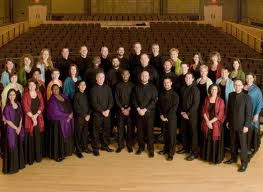 The version we heard in Austin for three soprano soloists and ‘a cappella’ chorus, performed by the Company of Voices, was extraordinarily beautiful. The voices of the soloists soared and the choir provided a hummed background in perfect balance. Conspirare is recording this concert for release by Harmonia Mundi. I would venture to add that if they wanted to go in that direction, I am sure “The Beatitudes” could easily become a ‘hit single’ as a download. One of the highlights of the concert was certainly Chesnokov’s “Do Not Cast Me Off in My Old Age,” a deeply affecting plea by a frail, elderly man for God’s help at a time when he fears his enemies will take advantage of his vulnerability. Chesnokov composed the piece for a basso profondo solo voice with choir, and the soloist is required to sing some of the lowest notes ever written for the human voice. Amazingly, Conspirare had just the man for the job - Glenn Miller, Director of Music and Organist at Kirk in the Hills (Bloomfield Hills, Michigan). Mr. Miller hit each note with accuracy and the most sonorous expression one could imagine. Low bass notes are not unknown in classical music; perhaps the lowest ever written by an Eighteenth Century composer is to be found in Osmin’s part in Mozart opera’s “The Abduction from the Seraglio.” Mozart wrote a D almost two octaves below middle C. More than a century later, Mahler called for an even lower note – a B flat more than two octaves below middle C. Chesnokov’s extraordinary piece has a C exactly two octaves below middle C.
One of the qualities that has long distinguished Russian choirs is the ‘blackness’ of the bass section. Basses in Russian choirs seem to be able to sing lower than their counterparts in other countries. This is one reason – another would be the difficulty of the language – that American choirs rarely sound convincing in this repertoire. But thanks to Mr. Miller and his colleagues in the Company of Voices, the concert of Russian sacred music we heard in Austin last week had exactly the unearthly Russian sound that the music requires. "The Sacred Spirit of Russia” was a glorious experience for me. I suspect that for many listeners in the audience at St. Martin’s Lutheran Church in Austin last week, it was a jaw-dropping introduction to a rich tradition of inspiring and uplifting music. Vladimir Morosan has built a large collection of Russian choral scores and made many of them available as sheet music published by Musica Russica. Much of this music is available for sale on his website along with a wide range of recordings of Russian choral literature.